The Department of Mines and Petroleum opened the 2017 Acreage Release at the Australian Petroleum Production and Exploration Association (APPEA) conference in Perth on May 15th. Mines and Petroleum Minister Bill Johnston is inviting applicants to bid on five onshore release areas in the Canning Basin, varying in size from 5,324 to 6,667 square kilometres. The release provides explorers with new opportunities to invest in the oil and gas sector, and offers long-term support in investing and developing Western Australia’s petroleum resources. 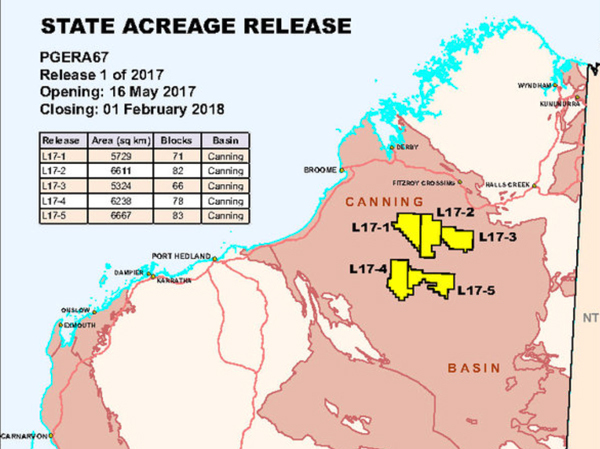 Interest in the Canning Basin has increased in recent years with new oil play discoveries at Ungani in October 2011 and Ungani Far West 1 in March 2016. There were also good oil and gas shows in the Ordovician Goldwyer Formation shale in the Theia 1 well drilled in July and August 2015. The nomination period for the 2017 acreage release close at 4pm on Thursday, February 1, 2018. Any acreage awarded will be subject to the State Government’s policy with respect to hydraulic fracturing. ©2019 Government of Western Australia, All Rights Reserved.